TRIVIA of Noh : Q81 : What is "Rōsoku-noh"? | Home | Trivia | Q81 : What is "Rōsoku-noh"? Takigi-noh (outdoor Noh performances by the light of bonfires) is very popular because people can see it as a casual event, even if they feel that a Noh theatre might be hard to visit. Although being able to admire the details of splendid costumes and watch every movement of dances and actions under bright indoor lighting is a good way to enjoy Noh, in flickering light it can seem even better. In their minds’ eyes, people sense things in the areas they cannot see. Taking a lead from takigi-noh, rōsoku-noh (Noh by candlelight) has been employed for some indoor productions at Noh theatres. 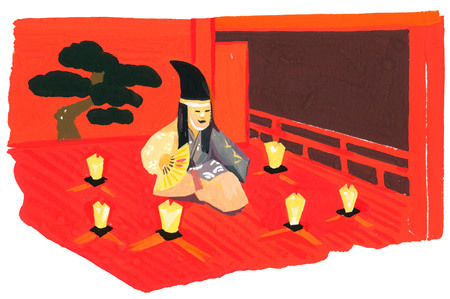 Back in the days when the candle was the primary interior light source, many Noh theatres presented plays by faint candlelight. Reborn as a new staging device, the old look adds an extra layer of mystery. In the light of the flickering candles around the stage, details of gold and silver embroidery and the expressions of the masks grab your attention. Every movement of the actors seems to be floating in the darkness. Rather than using real candles, some theatres employ flickering bulbs wrapped in paper to create warm lighting like candlelight, showing that less can reveal more.